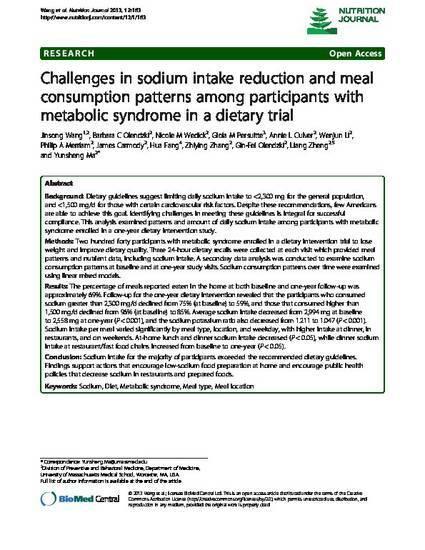 BACKGROUND: Dietary guidelines suggest limiting daily sodium intake to METHODS: Two hundred forty participants with metabolic syndrome enrolled in a dietary intervention trial to lose weight and improve dietary quality. Three 24-hour dietary recalls were collected at each visit which provided meal patterns and nutrient data, including sodium intake. A secondary data analysis was conducted to examine sodium consumption patterns at baseline and at one-year study visits. Sodium consumption patterns over time were examined using linear mixed models. RESULTS: The percentage of meals reported eaten in the home at both baseline and one-year follow-up was approximately 69%. Follow-up for the one-year dietary intervention revealed that the participants who consumed sodium greater than 2,300 mg/d declined from 75% (at baseline) to 59%, and those that consumed higher than 1,500 mg/d declined from 96% (at baseline) to 85%. Average sodium intake decreased from 2,994 mg at baseline to 2,558 mg at one-year (P < 0.001), and the sodium potassium ratio also decreased from 1.211 to 1.047 (P < 0.001). Sodium intake per meal varied significantly by meal type, location, and weekday, with higher intake at dinner, in restaurants, and on weekends. At-home lunch and dinner sodium intake decreased (P < 0.05), while dinner sodium intake at restaurant/fast food chains increased from baseline to one-year (P < 0.05). CONCLUSION: Sodium intake for the majority of participants exceeded the recommended dietary guidelines. Findings support actions that encourage low-sodium food preparation at home and encourage public health policies that decrease sodium in restaurants and prepared foods. Copyright 2013 Wang et al. ; licensee BioMed Central Ltd. This is an open access article distributed under the terms of the Creative Commons Attribution License (http://creativecommons.org/licenses/by/2.0), which permits unrestricted use, distribution, and reproduction in any medium, provided the original work is properly cited. Gioia Persuitte is a student in the Clinical and Population Health Research Doctoral Program in the Graduate School of Biomedical Sciences (GSBS) at UMass Medical School.